10% off new SS17 Replay Jeans! This month at Apache, we’re offering a fantastic 10% discount on one of our most beloved brands — Replay. The Italian giants are known for their innovative and stylish jeans, which have built up a loyal following with our customers. Feast your eyes on Replay jeans new SS17 denim range. We’ve got all the bases covered, from a super-light Green denim jean to a remarkably stretchy Hyperflex slim fit. Introducing a brand new Replay jeans fit — Grover. This is a classic straight fit jean with a regular slim fit waist, suitable for all manner of guys, from sporty to skinny. As you’d expect from a summer jean, the 13 oz bright indigo denim comes in a light stonewash that goes well with a T shirt or vest. As usual, the finer details are where Replay traditionally excels: notice the 3D creases and subtle distressed edges. Truly a highlight of our Spring Summer 2017 collection at Apache. 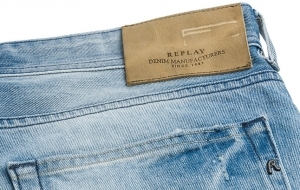 Check out this Vintage Green Wash by Replay Jeans ideal for guys seeking an alternative to the usual light/dark blue options. Incredibly lightweight at 9.5 oz denim, this slim fit jean leaves more than enough room around the thighs to satisfy those “athletic” gents. The( 2%) Stretch bull denim ensures maximum comfort in any situation, while the slightly tight leg brings out a flattering shape. Remember, this is a limited run of a Seasonal Wash , so get in there while you can. Also available in Indigo Wash .
Replay’s Hyperflex range has been hugely popular at Apache since hitting our shelves two years ago. Customers adore the innovative stretch technology — which offers amazing comfort in virtually every position — as well as the authentic, quality denim look. For SS17, Replay jeans have rolled out some magnificent new washes, none more eye-catching than this Double Indigo jean. For guaranteed style and comfort for years to come, look no further. Proving popular instore with Rave reviews from many of our lovely Regular Customers,they are definitely here to stay! Available in 8 washes . World famous for jeans, Replay also design stylish belts, underwear, and T shirts. These cotton-rich boxer shorts are designed for superior male comfort, and include a touch of stretch. As always, you can’t go wrong with plain black and white. There’s also this stunning buffalo hide belt, with a subtle “crocodile skin” adorning its saddle hide leather. Head down to the online checkout with the offer code REPLAY17 for 10% off all Replay gear! PreviousWin – Farah Goodie Bag Giveaway!